Driven and inspired by its humanitarian and Christian values, the Lebanese Hospital Geitaoui - UMC commits itself to caring for and treating patients regardless of religion, gender, race, disability or socio-economical background, at all times and under all conditions. In agreement with the Lebanese decree 574, on Patient Rights and Informed Consent, the patient’s role in making decisions about their care is fundamental to our practices. 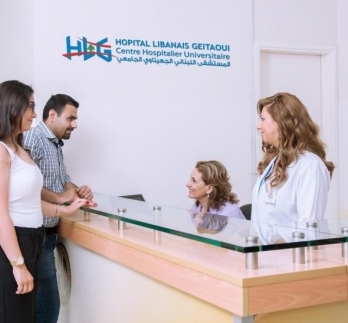 At the Lebanse Hospital Geitaoui - UMC, we truly believe in the importance of the patient’s engagement in maximizing the safety and quality of care. Receive considerate and respectful care, provided in a safe environment, free from all forms of abuse, neglect, harassment, assault, and/or exploitation. Have your personal privacy and confidentiality of all communication, information and records pertaining to your care. Receive complete and current information concerning your diagnosis, treatments and procedures, clinical status and prognosis in terms that you can understand. The explanations regarding treatments and procedures should include the possible benefits and risks, potential side effects, potential costs, as well as discussion of alternatives. Access to all the information contained in your medical record upon official request. Choose your treating physician(s) and participate in any decision making regarding your care when medically possible. Accept or refuse any procedure, drug or treatment and be informed of the consequences of such refusal. Request religious and spiritual support. Know if the treatment involves research of experimental methods of treatment and the right to accept or refuse to participate. Voice complaints regarding the treatment and care provided either directly or through the hospital complaint procedure without fear of recrimination or penalty. Respect the rights of other patients, hospital personnel and hospital property. Follow hospital rules and regulations to help ensure the safety and comfort of all patients. Observe the hospital non-smoking policy. Inform the hospital as soon as possible if you feel your rights have been violated or your safety is a concern. Protect and safeguard your property in your possession and control. Follow the treatment plan and instructions of your physician as well as the instructions of nurses as they carry out your physician’s orders. Seek clarification from your physician or your healthcare team when you do not understand what you have been told about your diagnosis or treatment, or if you have doubts or concerns about the treatment you are getting. Accept responsibility for any medical consequence should you choose not to follow your physician’s orders or refuse treatment. Respect other patient’s rights to privacy and calm. That would include the use of radio, TV and limit the number of visitors respecting the visiting schedule. Bring your hospital ID card if you possess one, your medical card/ insurance card and proper identification upon every visit. Respect all given appointments; notify the hospital or physician when you are unable to do so. Provide the necessary third party payers information for bill processing, and fulfill the financial obligations as promptly as possible.